NASA's Combined Operational Load-Bearing External Resistance Treadmill (C.O.L.B.E.R.T.) is named for comedian Stephen Colbert. A backronym or bacronym is a specially constructed phrase that is supposed to be the source of a word that is, or is claimed to be, an acronym. Backronyms may be invented with serious or humorous intent, or may be a type of false or folk etymology. By contrast, a backronym is constructed by creating a new phrase to fit an already existing word, name, or acronym. For example, the United States Department of Justice assigns to their Amber Alert program the meaning "America's Missing: Broadcast Emergency Response", although the term originally referred to Amber Hagerman, a 9-year-old abducted and murdered in Texas in 1996. Backronyms are also often used for comedic effect, as exemplified by NASA's C.O.L.B.E.R.T. NASA named its ISS treadmill the Combined Operational Load-Bearing External Resistance Treadmill (C.O.L.B.E.R.T.) after Stephen Colbert. The backronym was a lighthearted compromise in recognition of the comedian's ability to sway NASA's online vote for the naming of an ISS module. Backronyms can be constructed for educational purposes, for example to form mnemonics. An example of such a mnemonic is the Apgar score, used to assess the health of newborn babies. The rating system was devised by and named after Virginia Apgar, but ten years after the initial publication, the backronym APGAR was coined in the US as a mnemonic learning aid: Appearance, Pulse, Grimace, Activity and Respiration. Alcoholics Anonymous and other 12-step programs use backronyms as teaching tools, similar to slogans such as "one day at a time", or "Let go, let God", but often with an ironic edge. For example, a slip may be expanded as "Sobriety Losing Its Priority", and denial as "Don't Even Notice I Am Lying". Backronyms are also created as jokes or as slogans, often expressing consumer loyalties or frustration. For example, the name of the restaurant chain Arby's is a play on the letters "RB", referring to the company's founders, the Raffel brothers. An advertising campaign in the 1980s created a backronym with the slogan "America’s Roast Beef, Yes Sir!" Some backronyms name the subject to make obvious its purpose or characteristics; the GBU-43/B Massive Ordnance Air Blast bomb (abbreviated MOAB) and others in the series were heavily promoted by the United States as the 'Mother of All Bombs', a backronym during the Iraq War. US news coverage in the days leading up to the United States 2003 invasion of Iraq claims 'Mother of All Bombs' to be the US response to Saddam Hussein's phrase "mother of all battles" from the first Gulf War. In commercial aviation, ETOPS is officially an acronym for Extended-range Twin-engine Operational Performance Standards, defining safety standards for long-distance over-water flights by planes with only two engines, but in aviation vernacular, the colloquial backronym is "Engines Turn Or Passengers Swim." Many companies or products have spawned multiple humorous backronyms, with positive connotations asserted by supporters or negative ones by detractors. For example, the car company Ford was said to stand for "First On Race Day", by aficionados, but disparaged as "Fix Or Repair Daily", by critics. Similar backronyms have been directed against many other automakers, such as "Fix It Again Tony" for Fiat. Backronyms have also been coined by military personnel during wartime. The backronym for Spam, "Something Posing As Meat", was said to have originated from jaundiced soldiers who were sick of eating canned meat. The British contribution to the 2003 invasion of Iraq was code-named "Operation Telic", which was derived from the Greek word τέλος (telos), meaning "a purposeful or defined action". The meaning was initially unknown but as initial planning took place over the Christmas 2002 period, the term became jokingly known amongst service personnel as a backronym for Tell Everyone Leave Is Cancelled. Backronyms are sometimes created to name laws or programs. The official title of the USA PATRIOT Act, a 2001 Act of the U.S. Congress, is "Uniting and Strengthening America by Providing Appropriate Tools Required to Intercept and Obstruct Terrorism (USA PATRIOT) Act of 2001". Sometimes a backronym is so commonly heard that it is widely but incorrectly believed to have been used in the formation of the original word, and amounts to a false etymology or an urban legend. Examples include posh, an adjective describing stylish items or members of the upper class. A popular story derives the word as an acronym from "Port Out, Starboard Home", referring to first class cabins shaded from the sun on outbound voyages east and homeward heading voyages west. The word's actual etymology is unknown, but it may relate to Romani påš xåra ("half-penny") or to Urdu safed-pōśh (one who wears "white robes"), a derogatory term for wealthy people. Lexicographer Jesse Sheidlower writes in his book The F-Word that acronyms were rare in the English language prior to the twentieth century, and most etymologies of common words or phrases that suggest origin from an acronym are false. Other examples include the brand name Adidas, named for company founder Adolf "Adi" Dassler but falsely believed to be an acronym for "All Day I Dream About Sports"; Wiki, said to stand for "What I Know Is", but in fact derived from the Hawaiian phrase wiki-wiki meaning "fast"; or Yahoo!, sometimes claimed to mean "Yet Another Hierarchical Officious Oracle", but in fact chosen because Yahoo's founders liked the word's meaning of "rude, unsophisticated, uncouth". The distress signal SOS (with the overbar indicating that it is a prosign, sent as a single Morse character) is often believed to be an abbreviation for "Save Our Ship" or "Save Our Souls". In fact, it was chosen because it has a simple and unmistakable Morse code representation – three dots, three dashes, three dots, all sent without any pauses between characters. 1 2 McFedries, Paul. "bacronym". Word Spy: The World Lover's Guide to New Words. WordSpy.com. Retrieved 2009-05-19. ↑ Levey, Bob (November 8, 1983). "When You Can't Decide, You Just Pick Them All". washingtonpost.com. The Washington Post. Retrieved 22 January 2016. ↑ "Acronym". Dictionary.com. Archived from the original on 28 October 2006. Retrieved 2006-11-15. ↑ NASA. "RADAR means: Radio Detection and Ranging". Nasa Explores. ↑ "AMBER Alert - America's Missing: Broadcast Emergency Response". Amberalert.gov. 2007-11-01. Archived from the original on 27 July 2010. Retrieved 2010-07-08. 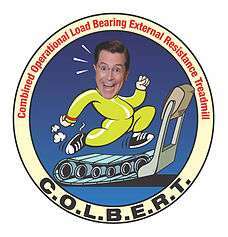 ↑ "COLBERT Ready for Serious Exercise". National Aeronautics and Space Administration. 2010-10-23. Retrieved 2013-06-13. ↑ "The Virginia Apgar Papers - Obstetric Anesthesia and a Scorecard for Newborns, 1949-1958". U.S. National Library of Medicine, NIH. Retrieved 2008-11-18. ↑ Keep Coming Back: Humor and Wisdom for Living and Loving Recovery by Meiji Stewart Google Books Result. Hazelden Publishing. 1999. ISBN 978-1-56838-378-1. Retrieved 2008-07-08. ↑ Lord Wolf Designs. "Recovery Related Acronyms and Meanings for A.A. & N.A. use". 12-steps-recovery.com. Retrieved 2010-07-08. ↑ Gross, Daniel (2009-11-07). "Too Much Beef: Why Arby's is so low on the restaurant food chain.". Slate.com. Retrieved 2010-07-08. ↑ "Air Force Tests 'Mother of All Bombs'". Fox News. 2003-03-12. Retrieved 2013-06-13. ↑ "Drag Racing's Internet Magazine". Competition Plus.com. Archived from the original on 2009-10-23. Retrieved 2010-07-08. ↑ Jalopnik.com (2012-01-27). "The definitive guide to derogatory auto acronyms". Retrieved 2014-06-17. ↑ BusinessBalls.com (2014-08-20). "acronyms and abbreviations". Business Balls.com. Retrieved 2014-08-20. ↑ "Fix it again, Sergio – and then fix the rest of 'em". The Irish Times. May 6, 2009. Retrieved September 25, 2009. ↑ Johnson, John (April 30, 2009). "Fiat Has Long Shed 'Fix It Again Tony' Reputation". Newser. Retrieved October 5, 2012. ↑ Taggart, Caroline (2015). New Words for Old: Recycling Our Language for the Modern World. Michael O'Mara Books. ↑ Flynn, Mick (2010). Bullet Magnet: Britain's Most Highly Decorated Frontline Soldier. Hachette UK. ISBN 9780297860013. ↑ Quinion, Michael (2005). Port Out, Starboard Home: And Other Language Myths. Penguin Books. ISBN 0-14-101223-4. ; published in the US as Quinion, Michael (2006). Ballyhoo, Buckaroo, and Spuds. HarperCollins. ISBN 0-06-085153-8. ↑ "posh, adj. and n.". Oxford English Dictionary. Oxford: Oxford University Press. 2009. ↑ Sheidlower, Jesse (2009). The F-Word. New York: Oxford University Press US. ISBN 0-19-539311-2. ↑ "The wiki principle". Economist.com. 2006-04-20. Archived from the original on 7 October 2006. Retrieved 2006-11-15. ↑ "wiki - Definitions from Dictionary.com". Archived from the original on 6 December 2006. Retrieved 2006-11-15. ↑ "The History of Yahoo! - How It All Started...". Yahoo.com. 2001. Archived from the original on 29 November 2001. Retrieved 8 November 2015. ↑ Rohrer, Finlo (13 June 2008). "Save our SOS". BBC News Magazine. Retrieved 2012-07-10. Look up backronym in Wiktionary, the free dictionary.